Hallmark University is a nonprofit college in San Antonio offering degrees in Aviation Maintenance, Information Technology, Cyber Security, Business, and Healthcare. Earn Bachelor's degrees in Healthcare Management or Nursing while utilizing our high-tech simulated hospital environment. The #1 university in Texas for Aircraft Technicians. Earn your Associate’s or Bachelor’s degree, and get an A&P certification. Learn with real-world scenarios from fortune 100 companies. Master's, Bachelor's, and Associate's degrees available. We partner with companies like Microsoft and Cisco to offer degrees in Cybersecurity, Information Systems, and Networking. Hallmark University was voted the education institution of the year by the North San Antonio Chamber of Commerce. 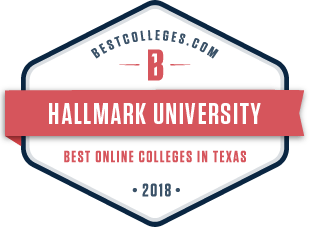 According to BestColleges.com, Hallmark University’s online learning programs rank among the best, and most affordable, in Texas. Hallmark University is number one in San Antonio at moving their students up two or more income brackets. We are making education affordable by offering programs with a lower net price and increased opportunity cost when compared to many other universities. Our programs are engineered to be delivered at a rapid pace. This allows our students to complete their degrees in nearly half the time of traditional university. Hallmark University offers master’s, bachelor’s, and associate’s degrees that align with current industry needs to give our graduates the best opportunity for success. Our students focus on seven character traits throughout their educational career at Hallmark that will benefit them for the rest of their life. Since our founding in 1969, Hallmark University has been committed to training individuals to enter the Aeronautics industry. This commitment is reflected today in our continuous development of one of the top Aircraft Maintenance schools in the nation. Our Aeronautics campus is centrally located on the San Antonio International Airport. Our degree programs in Information Technology and Cybersecurity are built to prepare graduates for the evolving world of business and security. Our scenario-based education leads directly to certifications, so you can show employers that you’re ready for any challenge. At Hallmark University, we designed our simulation labs and facilities to look and feel just like a hospital and modern healthcare environments. Students practice and enhance their understanding of medical techniques by applying knowledge learned in the classroom on life-like models.